Tyrone manager Mickey Harte has said the decision to narrow the pitch at Healy Park in Omagh by 4-6 metres had nothing to do with him. Dublin qualified for the All-Ireland semi-finals after a 1-14 to 0-14 win over Harte's charges yesterday evening. Harte claimed that altering the dimensions of the pitch was not mind games. "Narrowing the pitch has nothing to do with me," he said. "That was actually a request that came through from Sky, that they would like more clearance at the side for their technology. "The Omagh St Enda's cub asked me would I be okay with it and I said, 'Work away'. "People are reading too much into it in terms of a conspiracy theory. It was nothing to do with that. It was a practical matter." 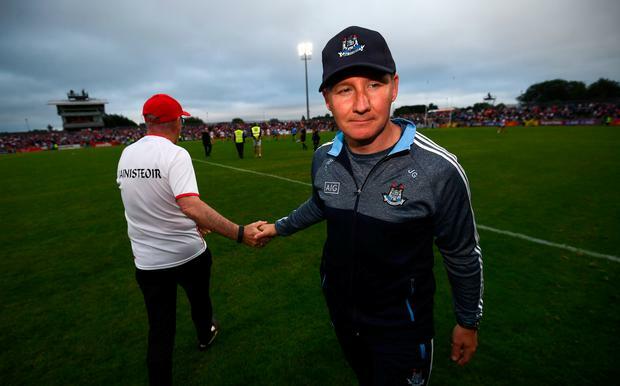 Dublin boss Jim Gavin played down the issue of the reduced playing area. Asked if it had unsettled his side, he said: "No, I don't think so. It probably brought the forwards closer to the goal." James McCarthy's fortuitous second half goal proved the difference between the sides but Harte was happy with how Tyrone finished the game having trailed by six points with 11 minutes to go. "We just went for it at that stage. There is no point trying to defend a five or six point deficit. We had to go for it. We decided to do that and maybe it took them a wee bit by surprise. We picked off some nice scores."